When a customer makes a reservation via any source, the booking is created. Then, any client payment made can be added to the booking with the Rental Ninja App. This lets you know, at any moment, how much is left to pay. This Rental Ninja's feature makes the difference, as it helps you to keep actualized your bookings payments status, from anywhere at any time, eliminating the need for a paper-based method for the responsible of the check-ins/outs. These payments are usually added by different users of the app, only if they are signed up and authorized for it (see roles article), like the check-in/out agents or reception personnel. The app will save the information about who added the payment and the payment method, for its control. How to add a payment? Go to the booking view from the booking you desire to add the payment. In the Payment tab, go to the Add payment button. Add the amount (decimals are introduced after a dot), notes related to the payment (if desired), payment date and method. Then click on the Save new payment button. See the next section of this article to know more about how does the payment status work and when you can't add more payments or too big amounts. After the payment is saved, you are directed to the payment information view. Find here the information about the person who has charged the customer this payment, the date, amount and payment method (credit card, PayPal, cash,...). If you want to add a picture, for instance, of the receipt or the cash given, you can do it here. Click on the add picture icon to do so. You can choose a photo from your gallery or do a new one. This is the only way to upload a photo that will be saved as payment picture. See more about picture types here. Then, your payment will be saved in the Recorded Payments section of the Payment tab of the booking. To recover the payment information, click on the "i" button at the right-hand side of the added payment. 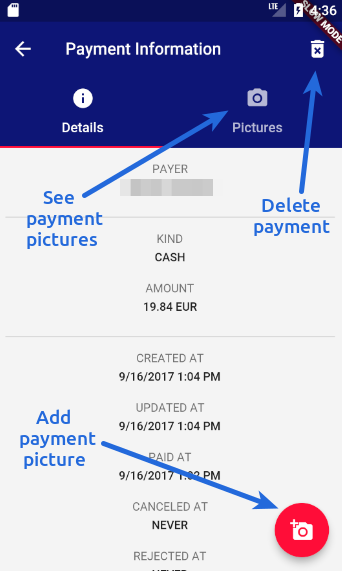 How to delete a payment? To delete a payment, look for it in the Recorded payments list. Click on the "i" button to go to the Payment information view. Finally, click on the top-right corner button of the paper bin to delete the payment. How does the payment status work? 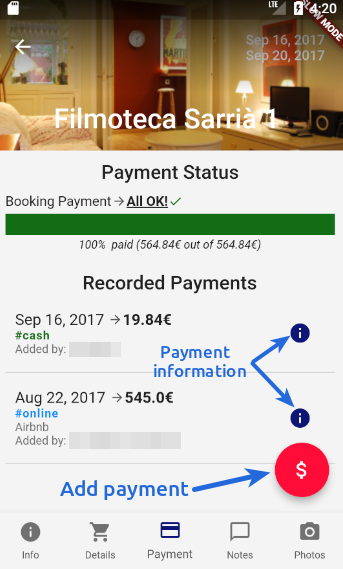 Once you add a new payment, the amount is used to complete the booking payment. Even if you are trying to save a payment of the damage deposit, this amount will go to fill the payment of the booking if it is not completed yet (instead of filling the damage deposit line). The reason for this is that in the event that the guest does not completely pay the booking price, the damage deposit would never be returned (or at least partially). So, only when the 100% of the booking payment is completed, when adding a new payment, the damage deposit line will be filled. When the booking is fully paid (including damage deposit if any). If you are trying to add an amount which will make the total bigger than the booking total plus the damage deposit (if any). When you are trying to put some money into the damage deposit before the arrival day. This only throws an error if the damage deposit hasn't been requested prior to the arrival day by the booking options. See the next section to know more about the damage deposit on the arrival day. 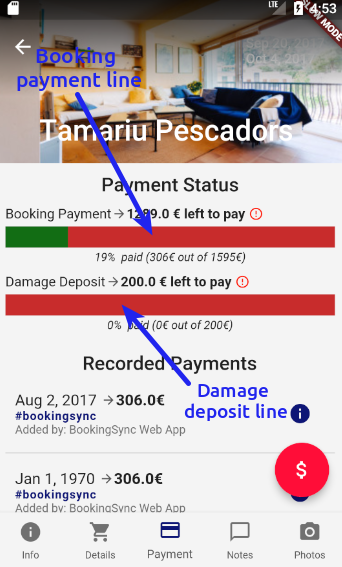 BookingSync doesn't allow to make payments to the damage deposit prior to 14h UTC (universal time). This means, that if you are doing a check-in before this hour, you will not be able to save the damage deposit payment in BookingSync. However, Rental Ninja allows it to you. You can add the damage deposit payment via Rental Ninja. It will be saved in our server and automatically stored at BookingSync server once it is possible. Hence you will see the payment in Rental Ninja but not in BookingSync until it is 14h UTC.